Here’s a nice new friend I met recently in my local travels—a columnar variety of the English Oak. These trees, which appear to be the Regal Prince variety—a cross between the English Oak (Quercus robur) and the Swamp White Oak (Quercus bicolor)—work great in landscaping situations because of their upright, tight, narrow profile. In other words, you get all the magnificent grandeur, fall color, and positive attributes of the mighty oaks without the space consuming growth habit associated with many of the spreading varieties. These columnar oaks can reach heights ranging from 40 to 60 feet, but with a lateral spread of only 15 to 20 feet. This makes them ideal for adding into the landscape near buildings, or for a formal planting in rows providing a dramatic but space-conscious addition of greenery installed as a border along driveways and walkways. The dense fullness of foliage along almost the entire height (except the exposed trunk near the ground) of these trees adds to their striking and unusual appearance. They actually resemble a magnificent upright shrub as much as they do a landscaping tree. 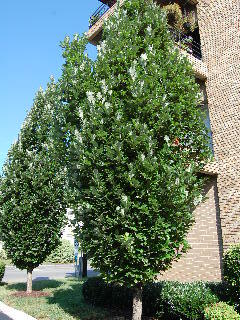 The columnar English oaks require full sun and moderate amounts of water. Their rate of growth is anywhere from slow to moderate, generally depending on conditions of soil fertility, sunlight, and moisture. The oaks, as we know, are famous for their slow but steady growth—they’re marathon runners, not sprinters. 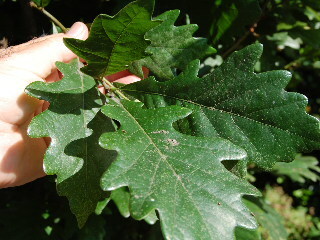 The top surface of the leaves is a deep dark glossy green, while the underside is a lighter colored silvery-white shade of green. This adds to their showiness as the gentle breezes stir the leaves about. The leaves of the columnar English oaks exhibit the classic leathery toughness of the leaves of so many other varieties of oak trees. In the fall of the year, the leaves of these columnar oaks provide a nice display of colors ranging from evenly yellow to various shades of red, orange, and reddish-yellow. In your home landscape, if you’re thinking about adding a magnificent hardwood tree that’s more for show than for shade, a columnar English Oak might be the answer. Check at your local garden centers and nurseries and see if one of these unique beauties is available.